Samsung their latest pair of smartwatches, the Samsung Gear S2 and Gear S2 Classic, made their debut at the IFA Trade Show in Berlin, Germany which was held from Friday September 4th 2015 to Wednesday September 9th 2015. Their Booth 101 at City Cube Hall B, Messe Berlin in Berlin, Germany was quite stunning, with their vision of the connected home clearly on display as reported in How SMART Signage made Samsung the center of attention at IFA 2015. But definately the show stealer was the much anticipated Samsung Galaxy Gear S2, their successor to the Samsung Galaxy Gear S smartwatch they released in October 2014 in Jamaica as noted in Samsung’s Galaxy Gear S Smartwatch coming to Jamaica while reppin’ for Tizen. These pair of smartwatches shows that Samsung had learned from the mistakes of the Samsung Galaxy Gear S and did their homework in terms of design aesthetics as well as functionality. The Samsung Gear S2 and Gear S2 Classic is their latest offering to challenge the now growing dominance of the Apple Watch. The Apple Watch is now 4 million strong, in the Second Quarter of 2015, Game of Thrones Style, nearly 35% of all the smartwatches and fitness trackers sold since 2013 according to analyst IDC as noted in my article Analyst IDC logs Wearables Profitable in Q1 2015 Fitness Tracker Business. Samsung therefore has a lot of catching up to do, with Christmas 2015 being the ultimate litmus test. Basically, its Apple vs Samsung, with Samsung being the classy underdog. So what do the Samsung Gear S2 and Gear S2 Classic bring to the table this time around that’ll wow the crowd? The design has improved for the better taking on the appearance of a typical mechanical wristwatch. 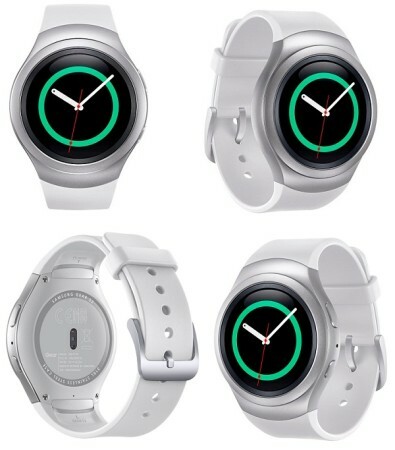 The Samsung Gear S2 as teased at the Samsung Unpacked Event in New York earlier on Thursday August 13th 2015 as noted in How Samsung Galaxy S6 Edge Plus Keyboard Cover Nostalgia wins Applause has a circular body design and bezel. This may be Samsung push towards those customers with a preference for the offering from the Swiss watch makers who like the traditional appearance of a wristwatch and are not too eager to try something that looks too unusual to be worn to a snazzy Corporate Gathering, Graduation or Christmas Party. 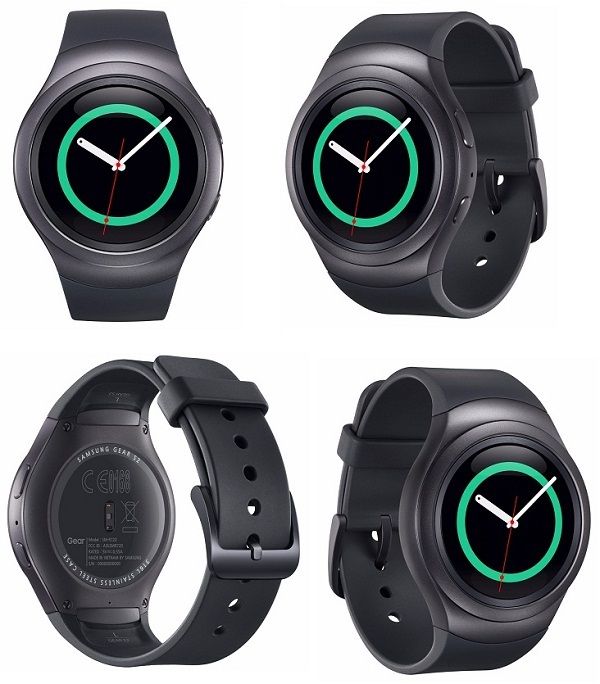 Samsung Gear S2 Classic, which weighs 42g and sports dimensions of 39.9×43.6×11.4mm, is for the discerning wearer who wants a smartwatch that looks like a regular timepiece that can be worn to any event, including the classic Black Tie events! It’s got the design chops to match, offering an elegant Black Finish clasped betwixt a genuine Leather band with classic rotating bezel and changeable classic watch faces to rival the likes of even the Aviator of the Breitling mechanical wristwatches. The Gear S2 is IP68 Certified Dust and Water Resistant and weights in a shade heavier at 47g with dimensions of 42.3×49.8×11.4mm. It is geared is for the busy commuter who also finds time to do a quick session of Yoga and may switch into a more active exercise based lifestyle of running, jogging or just hitting the gym for a round of tae-kwon-do. The jet set on-the-go crowd will marvel at its minimalistic and modern feel as reflected in the various watch faces. Its simplistic charisma will charm many a lover of fitness trackers such as the Social-Media savvy Fitbit Charge HR as per my titbits dropped in Why Fitbit Charge HR creates Exercise Competition among Gym Rats. 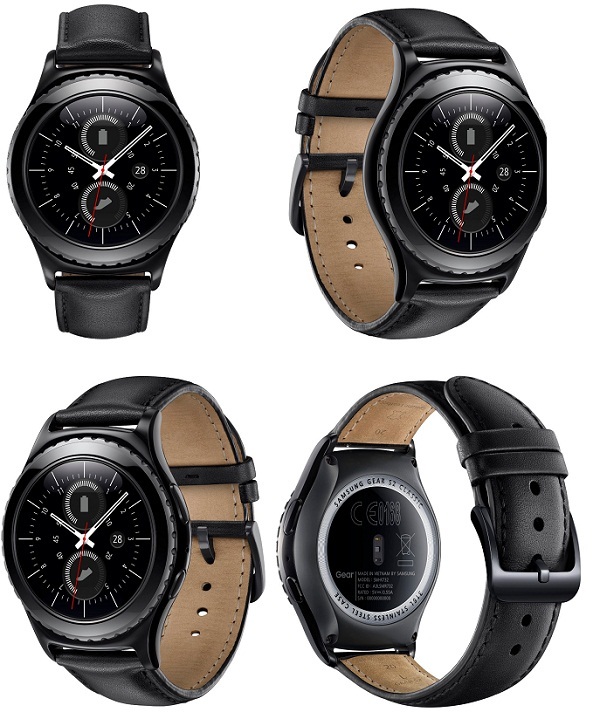 The Samsung Gear S2 classic will be available in a Black case with a Leather band. the Samsung Galaxy Gear S2 also has a white band option as shown below. Both are clearly a design nod to the Mechanical wristwatches made by the Swiss watchmakers that combines the modern aesthetic to enhance the wristwatch and make it into mobile arm candy. The Gear S2 has a unique rotating circular bezel with conveniently placed Home and Back buttons. Their placement is aimed at making accessing notifications and Applications easier and more natural. Aside from these aesthetic considerations, the Samsung Gear S2 is light and not has heavy or bulky as the unwieldy square that was its predecessor, the Samsung Galaxy Gear S. At 11.4 mm thin, it’s one of the thinnest smartwatches out there as Samsung and other wristwatch makers figure out ways to further miniaturize components and features into such a small device. The screen is a 1.2-inch circular screen has a 360 x 360 resolution (302 ppi), not noticeably lacking in detail and just the right level of brightness to make everything appear clear enough for even those with the worst vision to see. The S2 is powered by a more powerful optimized 1-GHz Dual-Core Processor with 4GB Internal Memory and 512MB of RAM. The Samsung Galaxy Gear S2 still runs Tizen OS, following in the footsteps of the Samsung Galaxy Gear S as noted when I’d checked it out at the Samsung Experience Store in Half-Way-Tree as per my ditty Samsung’s Galaxy Gear S Smartwatch coming to Jamaica while reppin’ for Tizen. This is a show of confidence in their Tizen OS, which is slowly gaining traction in the smartphone arena as noted in Samsung sells 1 million Tizen smartphones while seeking Developers. This faster processor and OS means a faster smartwatch with more efficient use of battery life that can support a myriad of new functionalities. You can avoid a rainy day thanks to the built in Barometer that alerts you when it’s about to rain. An Ambient Light sensor automatically turns on the backlight in conditions of low visibility, such as at night-time. Aside from being able to check notifications and your emails, make appointments on your Calendar via the built in Wi-Fi: 802.11b/g/n and even send text messages, it also includes Health and fitness tracking apps such as S Health and Nike+ Running. This is possible thanks to the built in Heart rate monitor, with which it can track your heard Rate using the LED Heart Rate counter on the underside of the Samsung Galaxy Gear S2. Combined with the Gyroscope and the accelerometer, this smartwatch can even track your running activity, making the Samsung Galaxy Gear S2 an equally great partner in the offices as well as in the gym. Using the built-in Bluetooth, it pairs with your Samsung Galaxy S6 Edge Plus smartphone, allowing you to see your activity 24 hours a day and keep your up-to-date via motivational reminders and notifications on your progress through the day in a bid to improve your fitness levels. You can also pair it to a nice pair of Samsung Level On Wireless Pro Headphones as covered in my article How Samsung Level On Wireless Pro headphones Motivates Caribbean people to Exercise as the Samsung Gear S2 supports the MP3, AAC, AAC+, eAAC music playback codecs. That means streaming via your Bluetooth connection for music formats such as MP3, M4A, AAC, and OGG sounding crisp and super clear without the need to have a Samsung Galaxy S6 Edge Plus strapped to your arm like an oversized heart monitor. Its phone capabilities, which includes built-in 3G Connectivity and the ability to make voice calls and send text messages means that you really aren’t tethered to your smartphone as in the case of the Apple Watch, which is just a watch without the Apple iPhone 6. This is possible thanks to the use of an e-SIM or Electronics SIM, a SIM Card replacement technology that’s the first of its kind in any Samsung product. It basically negates the need to insert a Nano SIM in such a small devices and frees up more space to cram more electronics into the Gear S2. The e-SIM Technology may also be coming to other devices such as laptops, Tablets and even the Samsung Galaxy smartphone line. Aside from this breakthrough technology, the Samsung Galaxy Gear S also comes with a NFC chips, enabling it to be used as a wireless payment option for Samsung Pay with security via Samsung KNOX as described in Samsung Pay supports NFC, MST with KNOX Security for Merchants and Banks. Samsung Pay is Samsung’s answer to Apple Pay in the USA and UK, which is now negotiating with British bank Lloyds. Samsung is also push Samsung Pay seeking support from various merchants and banks in the USA and elsewhere, with widespread acceptance being possible by Black Friday and then Christmas! This is mainly due to the fact that their payment platform is backward compatible with older magnetic strip readers via their proprietary technology called MST (Magnetic Secure Transmission) they’d acquired after purchasing payments startup Looppay as noted in How Samsung Galaxy S6 Edge Plus Keyboard Cover Nostalgia wins Applause. Samsung has a grander vision for the use of NFC isn’t their smartwatches. They’re already in negotiations with a wide selection of partners across different industries to have their NFC technology used as secure smart car keys, residential room keys and even as a security lock mechanism to grant secure access to sensitive areas. Samsung is also eyeing the Connected Home of tomorrow and envisions people using their Samsung Galaxy S to even remotely control devices at their homes such as the lighting, the central heating, the entertainment system and even the kitchen …..all from the user’s wrist! On a final note, the Samsung Galaxy Gear S2 has a 250mAh Li-ion battery that lasts for two (2) to three (3) days on a single charge, also one-upping the Apple Watches one (1) to two (2) days, depending on how actively you use your Apple Watch. Recharging is done using a wireless charging dock that has the Samsung Galaxy Gear cradled sideways, a neat trick which means that there is less fiddling when it comes to getting it recharge and ready for another round of kickboxing. I’d only wished that it had used the same Q Standard Wireless Charger as described in Samsung declares 2015 Year of Wireless Smartphone Charging becoming an Industry Standard that the Samsung Galaxy S6 Edge Plus also uses, making it once less charger to lug around with you. All these wonderful components that are great additions to the much improved Samsung Galaxy Gear S2 smartwatch line. But Samsung will need to woo more developers to use the Tizen OS platform as well as work more closely with smartwatch partners to offer a range of wrist straps and watch faces to better fit with their customers clothing styles as well as to connect with customers on an emotional level. The Tizen app store as a few thousand apps, but the range needs to be expanded to also include apps ported from Android as well as allow the Tizen Wristwatch to work with any smartphone. Rather than breaking the ecosystem of IoT decided they’re trying to build, this would serve to expand it to be inclusive of other members of the Android family in much the same way Google has now made it possible for Apple users to connect to Android Wear smartwatches. Even making it work with the Apple iPhone would be a plus, as after all, most people already have a smartphone; very few person will want to buy a Samsung Galaxy S6 Edge just to have it work with a Samsung Galaxy S2 smartwatch, no matter how much they love Samsung! Samsung has some ways to go before they can beat the likes of the Apple Watch. But right now, with the Samsung Galaxy Gear S2 can be seen as a much-improved homage to the Swiss watchmakers and their timeless mechanical wristwatches. Samsung Pay being able to work with older Magnetic Strip readers will fuel its acceptance among merchants and banks, putting them on par with Apple Pay, who already have a huge lead! To me, personally the possibility that the Samsung Galaxy Gear can get developers to rally to Tizen if they’ll allow it to work with any smartphone, including the Apple iPhone 6 and 6 Plus and the upcoming Apple iPhone 6S as predicted in Apple Event on September 9th 2015 – AI Siri, iPhone 6S, Apple TV and Pro iPad, will make it easier to achieving that goal of becoming the top Smartwatch maker in the World!